Rome must sees, such as Colosseum, Spanish steps and Vatican, and off the beaten path sights such as Appian way and the catacombs: easy 5 days itinerary. Rome wasn’t built in a day, and you will definitely need more than 24 hours to discover it! Actually, even though two or three rushy days may be sufficient to get a glimpse of the main sights, ideally you should try to dedicate not less than five days to the visit of the eternal city. So what should you see and do in Rome if you dedicated to this marvelous city 5 days of your Italian itinerary? Well, here are my suggested itineraries. They are designed as walking tours (the best way to discover Rome, in my view! ), so you don’t have to bother too much about public transportation. A good alternative is the Hop On – Hop Off roman buses, who work very well and will shorten your transfers from one sight to the other (plus giving you great views of the city from the upper deck). Click here to purchase your Hop On – Hop Off tickets in advance. On top of the standard ticket, there are several options, including a bundle ticket Hop On – Hop Off + Colosseum ticket. Note that most museums generally are closed on Mondays (with the exception of the Colosseum and the Baths of Caracalla). Almost all the museums normally are closed on December 25, January 1 and May 1 too. Ideally, try to reserve a hotel in the pedestrian area close to the Spanish steps. My preferred choice is the cosy Hotel La Lumière, a few minutes walking from the Spanish steps. Start this tour in Piazza Venezia. It’s easy to find, just at the end of via del Corso. From Piazza Venezia, visit the Campidoglio square, designed by Michelangelo, who “recycled” the roman temple of Jupiter. Visit Santa maria in Aracoeli, then take the Altare della Patria elevator for a wonderful view on Rome. Go to Via dei Fori Imperiali (passing close to the Carcere Mamertino, St Peter’s jail), then enter the archaeological area of Fori Imperiali (ticket needed, which includes also the entrance to the Colosseum) and visit the Colosseum, the Roman Forum and the Forum and the delightful Orti Farnesiani (renaissance garden build in the XVI century over the remains of the Emperors palaces). Queues to visit Colosseum are endless! Click here to Purchase your ticket in advance and to skip the queue, at a discounted price. After visiting the Colosseum get out the neaten path and have a nice walk in the medieval Rome to discover medieval cloisters and Roman houses and temples buried under medieval churches (click here to read my post). If your travelling with your kids, there’s a very interesting Colosseum and Forum guided tour for kids which will engage all the party and make this day a memorable family experience. At night, have a walk in Trastevere and find a nice restaurant there. My favorite: ristorante Roma Sparita, close to Santa Cecilia, for the best tagliolini cacio e pepe ever! Allocate nearly a full day for all this sites. A Vatican Museums and Sistine Chapel Guided Tour could be a good idea, to get the most out of your visit. Note that you can’t visit St Peter during Sunday morning (there’s the papal audience!). Do reserve your Vatican museum tickets, to avoid spending hours in queues. Don’t miss climbing up St Peter’s dome!. At night have a drink in one of Campo de’ Fiori wineries. This is also a good place for your dinner. Suggested restaurant: Ditirambo, 50 meters from Campo dei Fiori square or Ar Galletto to enjoy eating outside in beautiful piazza Farnese. 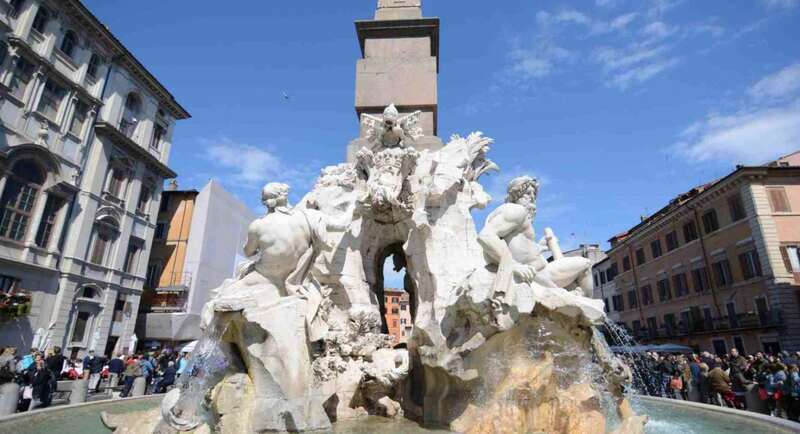 Start in Campo de Fiori (nice market on week days) and walk to Largo Argentina. There you can enter the old Jewish ghetto and discover this off of the beaten track Roman neighborhood. Have also a look at Portico di Ottavia and at Teatro di Marcello. Cross the Tiber river at Isola Tiberina and enter into Trastevere, heading toward Santa Maria in Trastevere Church. From there you can walk to the lovely Palatino neighborhood (fabulous view on Circo Massimo and on the Emperors palaces ruins), where you should visit the Giardino degli Aranci, the Santa Sabina church and the famous Key Hole with a view over St Peter (Piazza Cavalieri di Malta). At night, go back to the ghetto for a kosher dinner. My suggestion: Il Giardino Romano. Start your tour in Piazza del Popolo. From there, first have a look at Santa Maria del Pololo church (quoted in Dan Brown’s “Angels and Demons”) which hosts two amazing paintings from caravaggio). Walk up to the Pincio gardens (wonderful view on Rome) and keep on walking towards Trinità dei Monti. This is Villa Borghese, one of the most beautiful Roman parks, and a fantastic place for your morning jogging. If you have time, get into Villa Medici (ticket required) and visit the renaissance palace and gardens. Continue to Trinità dei Monti where you will have the Spanish Steps at your feet. Go down, admire the Barcaccia fountain and, why not, have a coffee at the famous caffé Greco. Keep walking on your left, pass via Cavour and get to Fontana di Trevi (have a coin ready to be thrown in the fountain!). Click here to read my Discovering the Spanish steps post . From Fontana di Trevi, cross via del Corso, heading to piazza del Pantheon (stop to visit Sant’Ignazio Church and to admire the amazing trompe l’oeuil painted on the roof. Visit the Pantheon, and the churches of San Luigi dei Francesi and the Basilica di Sant’Agostino (they host 3 wonderful paintings by Caravaggio) and continue to Piazza Navona. From there, you can lose yourself in the delightful and lively streets behind it (via del Panico, piazza del Fico, via dei coronari). A guided tour get to know everything about Barocco Rome could be a good idea, here is a good one, at a discounted price. When you are done vith Piazza Navona district, cross the Tiber at ponte Sant’Angelo and visit Castel Sant’angelo at sunset. Saint Angel castle could be your starting point for a magical night Rome walking tour (click here to read my Night Walk in Rome post). If the weather is good, you can’t miss a biking tour on the Appian Antica archeological park (you will ride over an original roman causeway!) and a visit to the St Callisto and St Sebastiano catacombs. Click here to read my Cycling on History post. If the weather is not so good, you can still visit the catacombs and maybe, in case of rain, two amazing churches: Santa Maria Maggiore, San Giovanni in Laterano and the “Scala Santa”, reportedly brought back from Jerusalem. Believers use to climb it on their knees, quite a fascinating ancient tradition. Here you can find a good guided tour which combines these four sites). In the afternoon, you can explore the delightful Rione Monti (it’s just buhind the colosseum) and visit San Pietro in Vincoli, which hosts the famous Mosè statue by Michelangelo. Rione Monti is an excellent place for a drink and a for your last Roman dinner. My favorite place: bottiglieria ai tre scalini. It’s the top drinking place in the neighborhood, but you will find a lot of nice restaurants in the same street (via Panisperna). Enjoy your Rome in 5 days itinerary! Rome can provide you with all kind of great experiences! Click here to check your many options, from guided tours to shopping, food experiences and more! If only I would have known about the biking tour ! Maybe next time. Maybe next year. Thanks for sharing this concise and useful article.